It took a pretty strong team to make the top 10 this week, let alone win. Ten players had winner Jason Day and runner-up Jordan Spieth, plus 8 of those also had 4th place finisher Justin Rose. So it took a little more than just picking winners to cash. Dave had that little extra this week and won by $14,348 over Steve. Dave benefited from his unique pick of T5 Brooks Koepka hitting it tight for eagle on #16 Sunday and shooting 11 under on the weekend. He also got some help from D.J. 's quad on #1 Sunday. It was Dave's 9th career major and 4th win of the year. Steve had one golfer different from 3rd place Brian, T25 Henrik Stenson versus T30 Rickie Fowler, and the one stroke difference between the two was $18,543. Bill ended up 4th, $41,610 short of cashing. Brian and Dave stayed 1-2 in the Summer Season race. Dave cut Brian's lead to about $287k. Steve moved up one spot to 3rd, just under $976k behind Dave. I am 4th, $242k behind Steve. Two tournaments left in this race. Brian moved up from 2nd to take the "T.M.C." lead. Jordie also moved up one spot and is 2nd, a bit over $500k behind Brian. Dave came up from 5th to 3rd and trails Jordie by about $73k. I am 4th in this race too. The final tournament of the year will be the last event in this pool. Since the top 3 players in the Year-Long race all cashed this week and finished within $33,000 of each other, those standings did not change. They are still Brian, Steve, Dave, me, in that order. 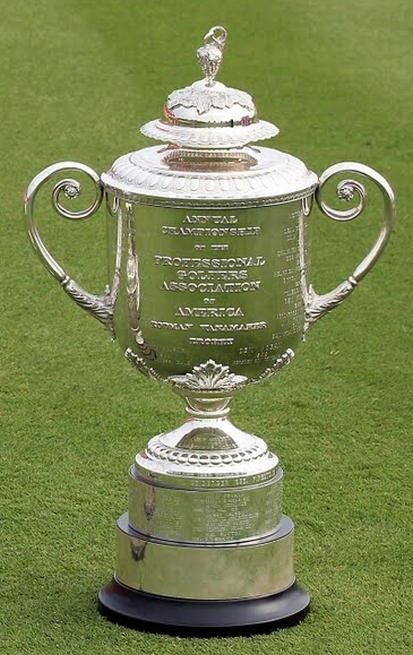 The next event in about 9 days is the first event of the PGA Tour's "year ending" greed-fest, the Fed-Ex Cup, The Barclays, held this year at Plainfield C.C. in Edison, New Jersey. Plainfield is a Donald Ross design, so this might be a little more enjoyable to watch than the usual New Jersey Fed-Ex Cup tournament. I don't know anything about the course, hopefully the original Ross design has been maintained and they didn't tear out the four best holes on the course just to build houses around it. Only the Granville people will get that one.